Sorry Mesa, but 6-7 Cole Bajema from Lynden, Washington is another shooting guard, not a post! All reports indicate Bajema has been one of the bigger breakout performers at the Las Vegas Classic this week. In the last three days Bajema has received offers from Washington, Oregon State and Virginia. I'm guessing that puts him out of our league. UP has offered 6-2 point guard Nate Hansen from Provo, Utah. Hansen is a 2019 recruit, but regardless of his committing or signing, he will go on his LDS two-year mission before showing up on campus to play ball in the summer of 2021. Probably another long-shot for the Pilots due to his LDS background, but 2 years away gives a young man plenty of time to consider or reconsider the decision he made as an 18 year-old. 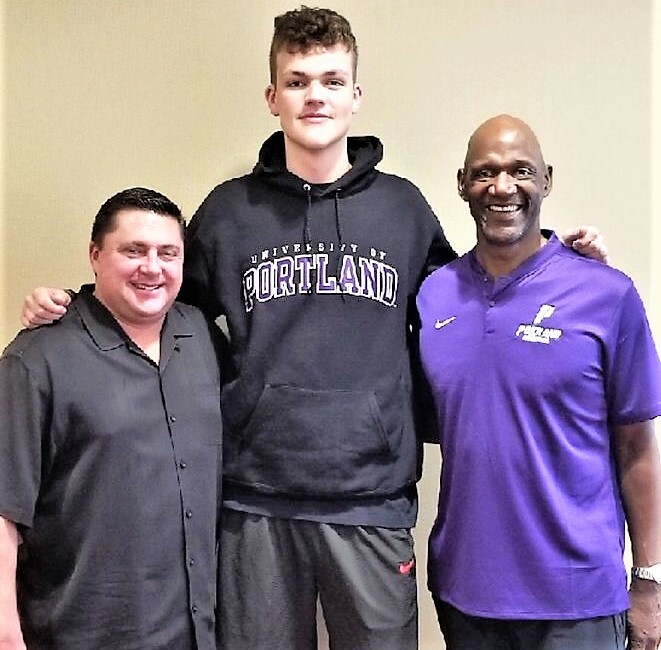 DoubleDipper wrote: Probably another long-shot for the Pilots due to his LDS background, but 2 years away gives a young man plenty of time to consider or reconsider the decision he made as an 18 year-old. Haha, well that didn't take long....Hansen just committed to BYU. What a surprise! NoPoNeighbor wrote: In the last three days Bajema has received offers from Washington, Oregon State and Virginia. I'm guessing that puts him out of our league. I have not reviewed the posts on this thread. Nonetheless, as of today, Donyae McCaskill, 6"2" point from St. Louis, is reported to have given Portland his verbal commitment, according to multiple sources, some of which have been retweeted by Coach Cantu. From my brief review of his internet film, Donyae can dunk. Not sure about his shooting nor his ability and willingness to share the ball. Note, however, the article linked below credits Donyae with court vision and quickness--we can always use that. Interested in the comments of others on this addition to the Pilots. wrv wrote: Donyae McCaskill, 6"2" point from St. Louis, is reported to have given Portland his verbal commitment, according to multiple sources, some of which have been retweeted by Coach Cantu. 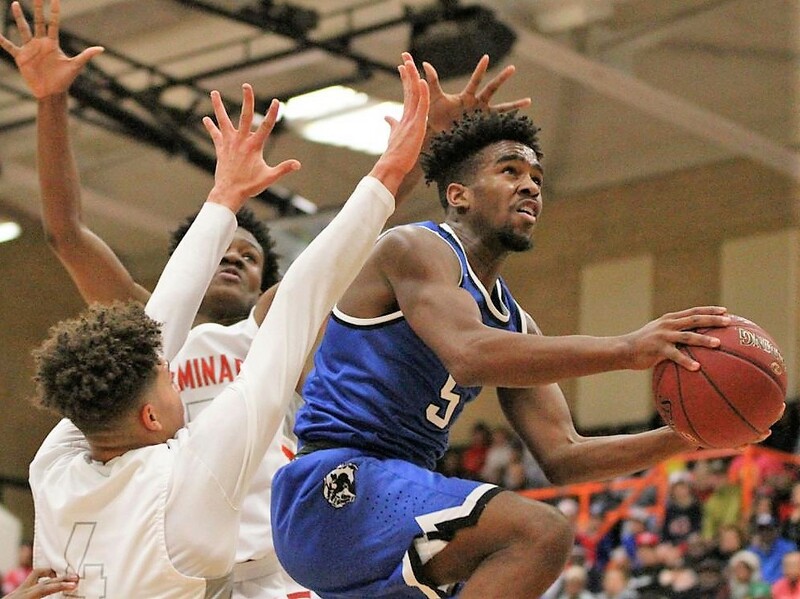 Donyae (listed most places as a PG, but in fact an excellent combo guard) has been visiting UP this weekend (he and his parents were at the soccer games on Friday evening), and he is just now heading back to St. Louis to finish his senior year at Vashon HS. Pending other arrivals, Donyae will clearly be the most athletic player on the team, and he should also be the best perimeter defender. In addition to his defensive skills, he's a slasher, a driver, and is able to elevate above the rim to score. At this point, he's probably just an average outside shooter, but if he were any better at that skill he would be heading to a major program, not UP, IMO. DoubleDipper wrote: Re: MarcusTsohonis....TP really likes him....and SG Marcus says he wants to go to a college where he has a good relationship with the coach and "know I can come in and play...I want to come in and get some experience my first year..."
Keeping with the low-major and mid-major trend, UP my have a couple of transfers before the 2019-20 season, but for now, only one scholarship should open up for the Class of 2019, SG Rashad Jackson's. Marcus committed to Washington after having trimmed his list to a number of Pac-12 and larger schools. Marcus apparently has a shooting touch. With all the fall sports doing so well, there hasn’t been much interest in MBB, but I thought we should clean up this thread a little. First, it would seem obvious that, with the exception of McCaskill, we can eliminate all the names of players previously listed here for 2019, including the two still listed by Verbal Commits, Chol Marial and Keshad Johnson. With the only available 2019 scholarship (the one not used by Ty Glover) now presumably going to combo guard Donyae McCaskill during early signing in November, it would be easy to figure 2019 recruiting is now done, but IMO it’s likely the Pilots will be looking for at least one more student-athlete to sign in November for 2019. Not just because it’s now a little easier for a player to transfer, but also because McSwiggan, Clark, and F. Porter will graduate in May with one year of eligibility remaining and will be eligible to grad-transfer if they wish. (I’ve spoken to Josh and Crisshawn, and neither have indicated any plans to leave, although it’s possible Josh could opt to play professionally back home in England). 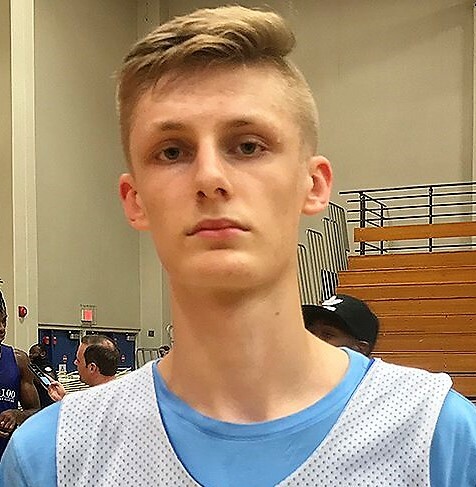 To make MesaPilot1 get excited about recruiting again, the staff is likely looking for a BIG MAN impact player who will sign early….and not necessarily a “under the radar” guy as in the past, but someone who’s getting some major interest…but maybe that’s just my wishful thinking. Visiting UP this weekend I saw a VERY tall guy at the men's soccer game, but I thought he must be just another freshman and didn't enquire about him. (Not enrolled at UP this semester as I'm getting a much more practical and wide-ranging education (Spanish, engineering, psychology, ecology, etc.) in Puerto Rico while continuing to help rebuild the country in the wake of Hurricane Maria that hit the island over a year ago....but when I can get the internet, I still read PilotNation!). Thanks for the info, StudentPilot, and thanks for all you are doing in Puerto Rico...serving others has often been the wonderful hallmark of UP students. Cody Collinsworth is a 7-0 post who has garnered interest from several high major schools. According to the Gonzaga and LSU fan forums, Gonzaga was the first on him and many followed suit including, TCU, LSU, Arizona State, Maryland, Kansas St., Oklahoma St., and others, but his only known offers are from TCU, Air Force, and Northwestern St. It appears he’s still considered a “raw talent,” but has the upside of being 7 feet tall with great timing on defense as a rim protector and is developing at a “fast rate” as a post player. 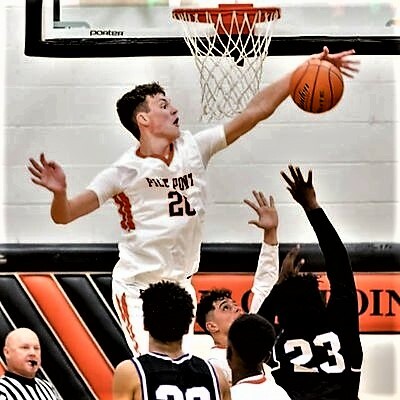 This past season at Pilot Point HS he went for 38 points, 13 blocks, and 17 boards in a district tournament game, and scored 40 points in another. “Texas Boys Basketball,” a prep basketball recruiting service, rates him as the 63rd best boys basketball player in Texas for 2019. Cody has transferred from 3A Pilot Point to 5A Lindale (about 90 miles east of Dallas) for the current school year, and apparently is NOT a relative of former BYU star and current NBA player, Kyle Collinsworth. Hmm. I’d say the Pilots would be the perfect landing spot for a kid from Pilot Point, but you could make a heck of an argument for Air Force too. DonyaeMCaskill @iceylife05 wrote: @Collinswor1Cody ayy bro you need to come and join the Pilot family, I'll be there next summer. Cody Collinsworth's stock is rising with recent interest from San Diego State, and offers from Wright State and Northern Colorado, in addition to Air Force, TCU, and Northwestern State. No word yet on how Cody's weekend visit to Portland went, but it would seem the coaching staff will have to sign him during the early signing period....before the other schools have a chance to watch him play his senior season in high school. Cody Collinsworth picks up a couple more offers, Furman, and late today, Minnesota. I did hear his visit seemed to go well as the long lad from Texas scrimmaged with the team during an open-gym period, and in addition to attending the soccer match, hung-out with the guys eating sushi and making all the obligatory academic visits too. Fingers crossed for another big recruiting step and an early signing for UP. GoodmanHoops wrote: Portland has landed 7-foot-1 Texas big man Cody Collinsworth. TCU, Minnesota and Air Force were also involved. An articulate summation: ditto wow! Collinsworth certainly has the potential to impact the Pilot fortunes. Wow--this is great news! WELCOME CODY! But where is this scholarship coming from? I would hope that none of the current players would be forced to transfer in order to make room for Collinsworth. It should always be the player's option to transfer. Maybe one of the Porter brothers would become a walk-on again in order to free up a scholarship. I don't know if there are other NCAA rules preventing this, but I don't think either of the Porters needs an athletic scholarship anymore. They can just get tuition remission per the regular employee policy. Cody rates 3 stars according to Rivals. Collinsworth, the most highly touted Pilots recruit since....heck, I don't know. Kevin Bailey I think was quite well regarded by a few of the ranking sites, wasn't he? Dean Murdoch wrote: Collinsworth, the most highly touted Pilots recruit since....heck, I don't know. Kevin Bailey I think was quite well regarded by a few of the ranking sites, wasn't he? Wait, have you forgotten all the angst we were feeling as school after school was making a recruiting run at current 3-star Pilot, Marcus Shaver? I agree it's not just the number of scholarship offers an athlete receives that differentiates one athlete from another, but Marcus had at least 15 known offers from some very fine schools, and as far as I can remember 3-star Kevin had one other possible offer besides UP, Colorado. DoubleDipper wrote: Wait, have you forgotten all the angst we were feeling as school after school was making a recruiting run at current 3-star Pilot, Marcus Shaver? Forgive me, it's still the offseason. NoPoNeighbor wrote: But where is this scholarship coming from? As mentioned earlier in this thread, McSwiggan, Clark, and F. Porter will graduate in May. Josh and Crisshawn have indicated their current plans are to return for one more year of ball after graduation. Franklin has not expressed that same plan. dholcombe wrote: I don't know if there are other NCAA rules preventing this, but I don't think either of the Porters needs an athletic scholarship anymore. They can just get tuition remission per the regular employee policy. There is no NCAA rule that prevents a student-athlete from receiving a tuition remission as a result of their parent being an employee of a university, but there is an NCAA rule that says that tuition remission will count against the allowed scholarships for any given sport....in the case of MBB, as one of the 13 scholarships allowed. However, after the parent has five consecutive years with a university, the tuition remission does NOT count against the allowed number of scholarships for any given sport. If TP is planning to give Franklin's scholarship to Collinsworth in 2019, and Franklin decides to stay at UP, TP will have to pay his tuition out of his own pocket.